Infinity's the limit for your little artist with the B. Toulouse Lap Trec Magnetic Sketch Pad. 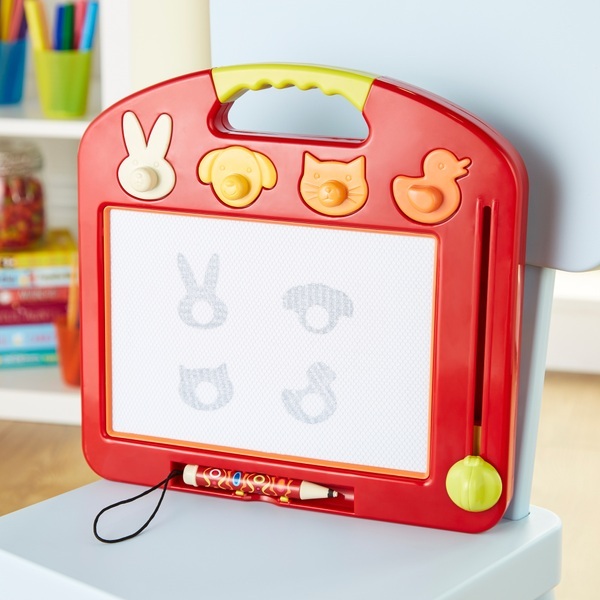 This awesome magnetic drawing board promises hours of no-mess doodlig and sketching fun. A simple pull of the knob wipes the slate clean, and 4 animal stamps provide additional creative possibilities. An ergonomic handle makes for easy carrying, and a snug cubby hole keeps the included pen safely in place during transport. A portable sketcher, this awesome children's toy fires the imagination, develops motor skills and encourages creative expression.